Bhumika Gurung, who plays Nimki in the TV show Nimki Mukhiya, will lend her voice to one of its episodes. In an upcoming episode, the cast will be seen celebrating the festival of Teej. Bhumika has sung a song for the celebration. It will play in the background. “Singing is my passion. I love to sing. Whenever I find some time in between the shots, I sing and post videos on my social media accounts,” says Bhumika. “My fans send messages to me to release a song. So now, I am all set to sing with all my heart and soul,” she adds. She’s TV’s new sunshine child! Bhumika Gurung who was declared the Best Debutante at the 11th Gold Awards, has recently been in news for some unkind reports talking about her weight gain. 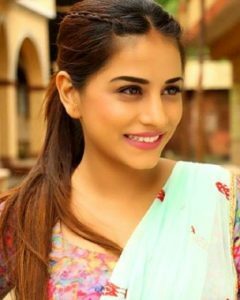 Bhumika Gurung who plays the character of Nimki in Star Bharat’s chart topping show Nimki Mukhiya has gained immense popularity in no time and recently the actress also received the prestigious Gold Award for the best debutante. Incidentally, she has been in news for some unkind reports discussing her weight. Several recent media reports claim that the actress has put on a few extra pounds and has been requested by her show’s production team to get back in shape. It has also been reported that the design team has had to alter Bhumika’s clothes, in accordance with her new weight. However, talking to #KhabarLive Bhumika lashes out at these reports and rubbishes them as malicious rumours. Here are the excerpts of our face-to-face session. What do you think of the unkind reports floating on the internet, referring to your weight? Why would the production ask me to lose weight? I m underweight anyway… if lose more I may just disappear (laughs). ALSO READ: Blackbuck Poaching Verdict: Will Brand Salman Khan Take A Beating? We understand that the reports are downright malicious, where do you think they are coming from? God knows from where these reports are stemming! My phone has been buzzing incessantly – everyone is asking me the same question. But I think there are certain clothes that make you look little chubby. Though, I must say, I don’t mind being chubby because women look cuter when they are a little chubby. Having said that, I think I am pretty much proportionate as per my height and body type. I don’t workout! I don’t have a fitness mantra as such. I am active, as I keep running around, jumping around and also try and do all my work myself. Also, I am blessed with good genes. Nobody in my family is obese or over weight. ALSO READ: Why Aamir, Shah Rukh And Salman Khan Suddenly Opted 'Oldies' Roles In Bollywood? Are you extremely diet conscious like other actors? No I am not diet conscious. I eat ghar ka khaana. I eat eggs in the morning. I avoid eating rice in the night. I am more of home cooked food kind of a girl(sic)! And I’m not a fussy eater, I consume everything. Plus, I am a very good cook so however tired I might be I like to go home and cook daal sabzi for myself. Previous article#StraightTalk: Why BJP Is On ‘Deathbed’ In Telangana?